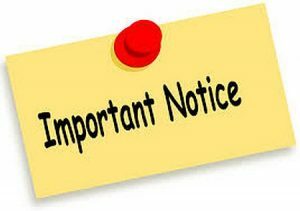 Thank you for your interest in a career at Lanpro Auto Care Centre Ltd.. Lanpro Auto Care Centre Ltd. is a family owned and operated business. We are a team of ambitious individuals, and teamwork has been the key to our steady growth over the years. We would welcome anyone who can offer us their expertise in any of the areas mentioned above. If you believe you have the skills to be part of the Lanpro Auto Care Centre Ltd. team, please complete the form below. We will review your response and contact you to arrange an appointment for you to stop by and fill out an application. You may also upload your resume here. Thank you for your interest in Lanpro Auto Care Centre Ltd.. I have always received reliable, friendly service at Lanpro. Nowadays everything is very expensive, especially vehicle maintenance. I have always felt that I have been treated fairly with the work that has been done and the cost. I give Lanpro a rating or 8.5. Trust me when I say that "Lanpro is the only way to go!" I have a long story to tell about 2 service guys at another shop, who tried to tell me that my transmission had to be replaced immediately. They wanted me to pay over $12,000.00 to replace it and fix an air pump. Now, this was a week before Christmas. I am going to try to keep this story short....In shock I called Lanpro. I used to use Lanpro for years, until I purchased a new car and I had to follow their warranty specs. So when I called Lanpro I was surprised that the main crew was still there after all these years! Matt took the time to listen to my profanity laden-ed hyperventilating rant on the phone and then gave me my options. I took my car to Lanpro pronto! They fixed the problem and I walked out with a bill of $1300.00!!! Quite the difference!!! Do not be fooled by the big high end dealerships and their pretentious service!!! Lanpro is a family owned business that treats you with the respect and the dignity that you deserve. Matt and Julian were great, very kind and explained everything to me in details. Being female, that is important to me. The guys at the 'other' place never listened to me and always talked to me like I was an idiot, that I didn't know what I was talking about. I cannot stress enough how important honest customer service is to me and I cannot stress enough that Lanpro is the place to go for it!! One of the reasons I stayed with the 'other' guys was for their shuttle service. What a mistake, because I have no doubt in my mind that if I needed a ride Lance and his crew would be more then happy to assist me. Thanks guys for bringing positive closure to my issues and for giving me peace of mind about any future issues with my car! I recently purchased a Dodge Dakota from Lanpro Auto Car. Matt was the salesman I dealt with. I particularly like their "no dicker" policy, It cuts out a lot of gameplay usually associated with car buying. I was extremely happy with my purchase, for a little over a week. Then on Friday evening while on the highway with cruse control set, the engine/ tac went from 1700 to 3000 rpm and back down, continually , while remaining at 100km. I called the shop as soon as they opened Saturday morning and spoke with Matt who said bring it in, which I did. They took it for a short road test, pulled it into the shop and read the code. They let me know the issue, ordered the part and had me back on the road again well before noon. The truck is back to 100%. Thanks guys. While I was there waiting I observed Matt dealing with another customer who had their car in for repairs. Matt was very patient explaining what needed to be repaired and the priority in which the work needed to be done. He demonstrated a genuine concern for their safety, at the same time appreciating the costs involved. It is that level of service that builds custom relationships that you won't find at many other shops. To the folks at Lanpro, Thank you so much for taking care of me and my car. I'm glad to have found you. Your team treat me with respect and kindness, fixes my vehicle in a timely manner, provides reasonable pricing, and Matt and Julian are always patient and thorough when communicating with me. My dad was always the go to guy when it came to vehicle maintenance (he was a welder and mechanic by trade) but he passed away in 2016. I can't rightly express how grateful I am that you treat your clients like family members. It sure makes a difference and means a lot. Enjoy those little treats. Thank You. Just a short note to Thank you for the First Rate Service and bringing my attention to other snags on the vehicle, very much appreciated. Lanpro has looked after my cars for many years. I have found them to be extremely efficient, and they always keep me up to date on factory advised repairs. My current car is a 1992 model, and they have kept it running like the proverbial Swiss watch. The staff is always friendly, and a pleasure with whom to deal. Keep up the great work! We just bought a 2008 Ford Ranger from Lanpro and totally love the truck. But the best part was buying the truck, wow,what a nice experience. The salesman, Matt, was amazing, no pressure sales. The guys even worked through their lunch break to put my plates on my new truck and clean the windows off. I was pretty excited to get driving, and they seemed to know it,lol. Of course no sold truck is complete unless it has a good detail to it, and these guys again came to play, and this truck had an amazing detail job. It's the little things that they didn't have to do, that they did do, that puts the smile on your face when you drive away from there. We are looking forward to dealing with this quality crew of techs for years to come. Thanks guys. You went above and beyond customer service today for me. I lost the heat in my car and you made room for my car even though you were swamped and getting behind in your service bays. Provided courtesy car service as I had health issues and you did not want me to have to sit in the shop waiting. I really appreciate all you did today and during the at least 20 years of awesome service. I bought my present car from here and one previous one. Lance and all his staff are 5 STAR business. Thank you so much. Just bought a vehicle from Lanpro. Looked at it Thursday, put down a deposit and picked it up today. Great service, very friendly staff. Got an excellent deal on the car with extras thrown in. Very honest and reliable. Will certainly be bringing the vehicle back there for future repairs. Would recommend them to anyone. Lanpro is awesome, I had a no start, towed it to Lanpro, got there an hour before closing but 8:30 the next morning got a phone call - your car is ready, NOW THAT'S CUSTOMER CARE. THANK YOU LANCE AND TEAM, YOU'RE ALL AWESOME! Very friendly and helpful staff, willing to answer all questions and give timely servce and estimates. Definitely above averaage for service and attention to detail. I have found their work to be Al and the estimates very accurate. Would definitely recommend this auto shop. I have been with Lance and Lanpro fairly much from the beginning, 20+ years. Lance has seen me through 4 cars. When it came time to purchase a new vehicle, knowing that Lance had started selling used vehicles himself, I decided to ask for his help. I don't know very much about vehicles, but I have trusted Lance with all my auto care and I knew that I could trust him on this too. I gave him the specifications of a type of vehicle that I wanted - higher off the ground, big enough to cart around 2 big dogs, space to take my Pampered Chef business out to home shows, and reliable enough to take me out to BC twice a year, dogs and baggage in tow. We decided a Caravan would meet my needs. After letting him know what I could afford, the hunt was on. We thought it would be easy to find, but Lance wanted to make sure that it was going to be what I needed and wanted. Though it took a couple weeks longer to find what we had hoped for, find one he did. And it is a great vehicle, I'm very happy with my Caravan, and it was a relief to leave it in Lance's hands knowing that he would look out for my needs, I hope he's still around when I need to make my next purchase! Although there were many issues that I was not that aware of that were wrong with my truck, Lance took the time to go through every detail of his findings & prioritised them for me. I have NEVER received such excellent service from any automotive service provider as I have from Lanpro. Lanpro was recommended to me by Lenny Peterson who, when he had a vehicle, only brought his car to your service station. Although I live in East Kildonan, directly across town, I will continue to bring my vehicles to Lanpro for servicing because to me it is worth the gas money & drive to receive the type of excellent personalized service I got from both Matt & Lance. For this I would like to thank you for your honesty & candor & not only have your received a new customer for life but you have received an excellent promoter of your service station. I will tell everyone I know & recommend that they tell their people to check Lanpro out for themselves & see. They will come up with the same great experience that I did, it is very odd for me to praise a company that just told me I have over $3000.00 in repairs that need to be done. Usually I would be cussing up a storm, but they way that it was handled & the way I was treated turned the cussing into promoting your service station. So I have to thank you for the experience, I can't thank you for the estimate, but I know it is nor your fault that those repairs need to be done. Thanks for the follow up. We appreciated that the technician noticed a problem that could be unsafe on the highway. Having a consistent staff that knows the history of our vehicle is also helpful. Also your rates are reasonable and competitive. The first time I brought in a van for repairs, Lanpro saved me several thousand dollars by explaining what was found wrong and what caused the problem. It's a very convenient location for us. Our vehicles are done when they say they would be. I find the pricing fair and they will squeeze us in when we need something done quickly. Thank you for your quick service and response to my request. Most times I am able to leave my vehicle for the day but yesterday, was different. I appreciate that you were able to change/install the winter tires on my vehicle while I waited. It made the rest of my day work out the way I had planned. As always, your service was excellent. I appreciate the professionalism as well as the courtesy shown by your staff. I am a regular and have recommended you to others. I have also been a customer since Lanpro opened its doors and have recommended you to many friends and family. The service I have received has been outstanding in workmanship as well as trustworthiness. Many a time when I have come to pay my bill I have been informed that a part was on sale and, therefore, my bill was less that what had been quoted. I respect that honesty and my pocketbook likes it too. Lance, your service technician(s) quality of work, have added life to my vehicle. I have been very satisfied with your organization's service and concern for good customer relationships. I have had Lanpro Auto service my cars and trucks since he first started out at Ellice and Wall, and are very pleased with all my dealings with them. I purchased a year old car for my wife from them and saved eight thousand dollars. At the present time our two sons and our daughter are getting their vehicles serviced by them as well. They are very pleased with their service. I recommend Lanpro to all my friends. I don't think there is better service anywhere. Much prefer you to the dealership (not that it's an unpleasant experience or they don't know what they're doing), it's just that I really feel I'm being treated & thought of personally at Lanpro. Thanks again, I always tell people how great you are. It is always a pleasure to be served by your people. They have always been very courteous, honest and very helpful. Repairs are very costly. I know that I can trust the work that has been done by your mechanics. It is my pleasure to do business with someone that I can trust. First off I just wanted to say thank you for the service from your staff; very professional, knowledgeable, and easy to talk to type of atmosphere. My old vehicle was written off due to an accident I was in, and thankfully I was alright, but as soon as I found out that I was going to need a vehicle it was very difficult especially just having put a lot on my old vehicle. Anyways I was in your shop a while back and saw some used vehicles on sale before my accident and what caught my attention as well as a future reference was that you weren't just offering a used vehicle. It was the service, quality and the type of service that you were offering that I usually don?t see or even hear often. Once I saw a couple of choices on your list I called you guys up, test drove the vehicles, asked questions and I am a very satisfied customer. The service was excellent, and just to conclude I felt very confident and a sense of relief once all the paper work was done and drove my vehicle. A very satisfied customer. I have always appreciated your willingness to accommodate my needs when it comes down to addressing emergency needs with my 'fleet' of vehicles from my family (Mercedes, Audi, Mazda 6, Mazda 3 and Subaru). Your quality of work and honesty is what sets you apart from many other shops. I have no hesitation recommending you to all my friends. I would just like to say thank you everyone at Lanpro. You always manage to squeeze me in your busy schedule whenever I need work on the car. I appreciate your helpful and friendly staff and I know I can always count on your great service. I've been coming here for a number of years with a number of cars and will continue to do so because you have never let me down. As usual your service was just great. You run a good solid, honest business, and we highly recommend Lanpro to all our friends and family. What impresses us the most is your honesty and how you stand behind your work. It has been a pleasure having Lanpro look after our vehicles for the last 18 years, and we look forward to many more years of receiving your excellent service. I've been dealing with Lanpro for 20 years. I travel almost 2 hours to have my car serviced by them. Been more than happy with the work and quality of the service. We send our children there knowing the service is up and beyond standard, and don't have to worry about their cars. Thanks a lot. Hey everyone at Lanpro, I love the Jeep, and the atmosphere of your shop is fantastic. I have been dreaming about owning a Jeep like this for over a year now. Thank you for everything. Thanks for taking great care with our vehicles over the years. We have never had bad service from you and when you suggest something needs to be fixed or replaced you always let us know a time line estimate or if it should be done very soon, which we appreciate. Your location is great for us as we live in the St. James area so it is convenient for us. You are very patient when you call to explain what is wrong with the vehicle, as you are talking to a novice on cars, so it all makes sense, and if there is something that I still don't understand you try to explain it and not get impatient with me. Keep up the great work! I thought I'd just take the time to let you know that I am MORE than satisfied by Lanpro's service! Your guys have been VERY good to me, which is a big deal, especially being a woman (it's easy to feel like you're being taken advantage of by some car shops-I've never had that feeling at Lanpro!) I won't be going anywhere else for service, that is for sure and I always tell people about your shop! I REALLY appreciate all your help with my Jimmy and look forward to dealing with you all in the future! Thanks so much for everything! I bring our vehicles to Lanpro Auto because of how fast they repair our vehicles. They are honest and repair only what's necessary. I was referred to Lanpro by my brother several years ago and I've been going ever since. Their service is second to none. They are knowledgeable, pleasant, trustworthy, honest and stand behind their work. I just wanted to thank you guys so much for making my decision to buy the PT my own. I felt absolutely no pressure, and very comfortable with the knowledge I received from Matt that kept me drawn back to Lanpro despite the potential of looking at cars elsewhere. I've been stating nothing but positive regarding my experience to others - from the time I picked up the phone, and inquired about purchasing the vehicle to the day I took it home. I am very confident that with dealing through Lanpro that I will be in safe reliable hands with informative, and honest work. Thank you guys so much again, I absolutely LOVE my car! I just wanted to thank your staff for being flexible about the pricing on the job they did on my van last week. Since I would have never known the difference between the 'easy to change' and 'hard to change' fan motors, I certainly appreciated the honesty in charging me for the job that was actually done. I?ll be sure to recommend your business to friends and colleagues when they are looking for a solution. I have been a customer of Lanpro Auto since 1989, since its former location on Ellice Ave. In fact, practically every member of my family has taken my advice to bring their cars to Lanpro. At Lanpro, a customer will always hear the truth, whether it's about how much longer a set of tires can last or how immediate the need is for a new brake master cylinder. 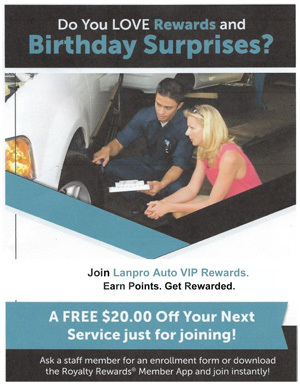 In a world where everyone is trying to make a buck, Lanpro Auto stands out as a true testament to customer service. I bring our vehicles because of the trust factor. Their efficiency is excellent and it's a top priority to get us back on the road. They are professional and keep track of what has been done. I am very happy with them and wish I would have found out about Lanpro sooner. Just wanted to let you all know, my truck feels like a new truck to drive. Thank you for not just fixing the problem, but improving the overall performance of the vehicle. Great Job!! I honestly wouldn't even consider going anywhere else to purchase a vehicle. These guys are very good, friendly, you will walk away with what YOU want...what YOU need, not what somebody told you is good for you. The vehicle I bought from them was in near mint condition..... this place is the Best in Manitoba!